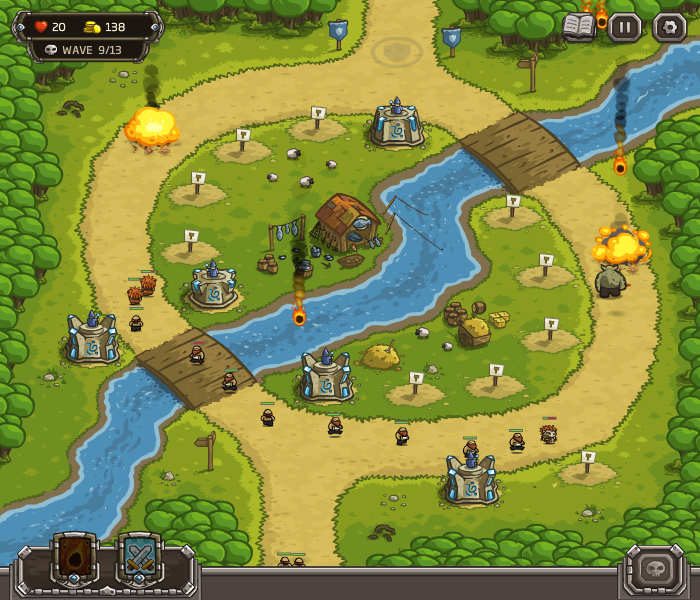 Now, while all the gaming community are waiting for the release of Kingdom Rush: Frontiers, let’s remind how back in 2011 the product of small Uruguay studio made a major breakthrough in the tower defense standards and became the best game of the year. Since the very first seconds of the game its graphics catch the player’s attention. The main menu depicts the scene of epic battle. Orcs are trying to break through the human defenses, but they are facing brave paladins, barbarians and archers. At the same time gargoyles’ air strike is countered by the wizards battle spells and dwarven rockets. This all inspires us to get to the action quicker. As the game starts, the first difference from the usual tower defense representatives we used to play comes to the stage. We are not allowed to build towers on arbitrary location – only on the allowed places. Due to this modification the common “select tower” interface panel was removed from the game screen and the entire 700x600 screen became the game field. Besides, specially on the initial levels, this ensures that the player will place the towers on the key strategic locations. 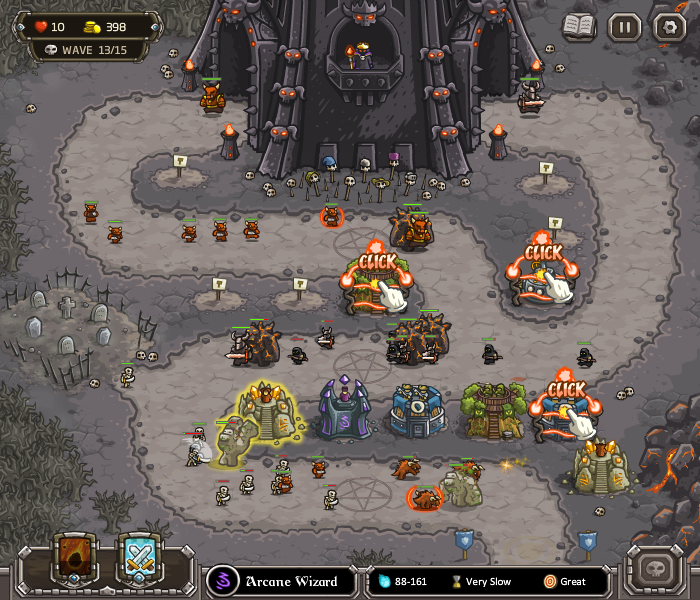 The enemies are encountered – and the in-game encyclopedia appears at once showing their strength and weakness. We learn that some enemies wear body armor, some others (on higher levels) are magic resistant. This requires clever actions from the defender. Oh, yes, towers! That’s what make the Tower defense, don’t they? You have four tower types available, each of them can be upgraded up to the 4th level. They are: Archer tower, Cannon tower, Mage tower and Outpost. The first three upgrades just increase the tower’s basic parameters, but after the fourth one it changes dramatically. Let’s take a closer look. 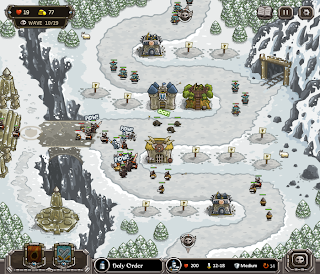 Archer tower is the usual tower with archers in it, like in many prior tower defense games. It shoots both land and air targets, its damage, range and firerate increase steadily after the upgrades. But on the 4th upgrade level the player has to make the important decision sniper vs ranger. The Ranger’s hideout has high firerate, but the Musketeers tower seldom shoots a devastating charge across half a map. All the 4th level towers have the unique abilities. Rangers can be equipped with the poisonous arrows and will sometimes summon the powers of the forest to slower the enemies. The Musketeers have a chance to make a headshot and sometimes shoot a grapeshot charge. 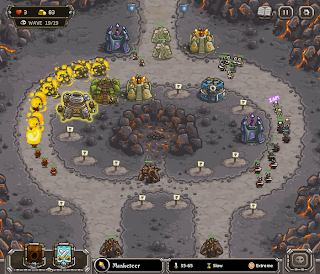 Cannon tower is operated by the dwarves, the most technologically advanced race of the Kingdom Rush’s world. It is effective against tight packs of land enemy units it deals splash damage. Making the 4th upgrade the user has a choice. He can continue the “big badaboom” line and get a Big Bertha – the super powerful howitzer which sometimes shoots rockets on the air targets. Another special ability of Big Bertha is the clustering charge, shrapnel. But after three cannon upgrades the dwarven engineers can completely rebuild the tower and turn it into Tesla X104. It charges the lightning bolts which hit up to 5 enemies. Besides, this tower can deal constant damage to all the enemy units surrounding it. Some enemies have protective armor – but the armor can’t protect from the attack of the Mage’s tower. The mages in the Kigdom of Linirea belong to two major schools: Arcane wizards and Sorcerers. Arcane wizards can cast death rays and teleport the enemies, and the Sorcerers are good at turning the enemies into sheep and summoning earth elementals. But no tower can help is the target is strong enough or fast enough to reach our base. 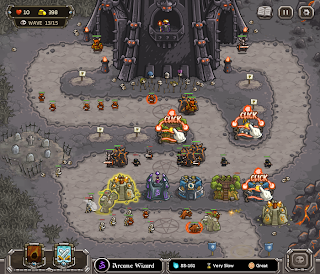 In several previous games of TD genre there were special towers which slow down the enemy allowing the other towers to stuff it with arrows and led. 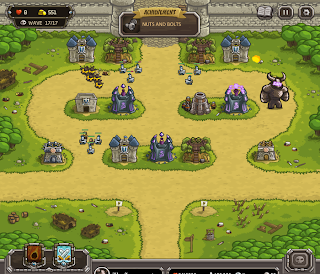 But in Kingdom Rush we have the Outpost! This is the barracks of the foot soldiers. They stop the advance of the evil forces often for the cost of their lives, but the shooting towers now get more tries to kill the enemies. It’s important to combine these tower types to get the most effect. As you upgrade the Outpost the soldiers become stronger and stronger, and finally they can become Paladins or Barbarians. Paladins are better protected and heal themselves, but the Barbarians throw their axes and nets and attack air targets. Usually in many TDs the player just built towers and watched how well were they defending the base. But in Kingdom Rush the battles became much more interesting. At first, we have 2 rechargeable spells: meteorite strike and reinforcements drafting. Carefully selecting where and when to apply them is often the key to the victory. One of the updates (this itself was the major innovations as many game developers release the game and forget about it) added the heroes: special units controlled by the player. 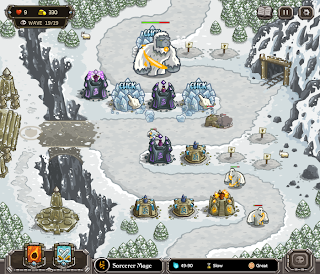 They have their unique powers, too, and the player must maneuver them cleverly to get the most from all the advantages. And look at the game world itself – it’s alive! The battle goes on, but somewhere the windmills are working, the sheep are pasturing, the wild goats are jumping on the cliffs. And have you tried clicking on a sheep many times quickly? You’ll be surprised! All this and even more (I haven’t mentioned the upgrade system and the bosses yet) made Kingdom Rush the paragon of a great game. 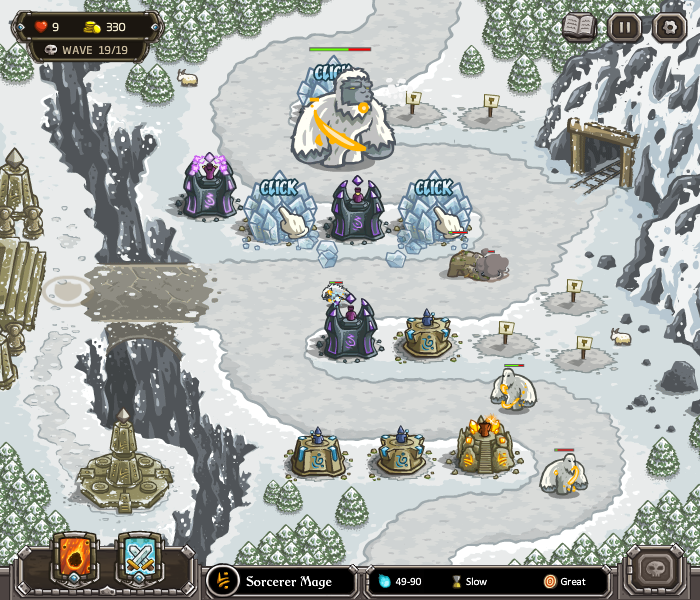 The story of its developers, Ironhide Game Studio inspired many young teams to make the games of their own. Sometimes the new projects just copied some graphics or design features. 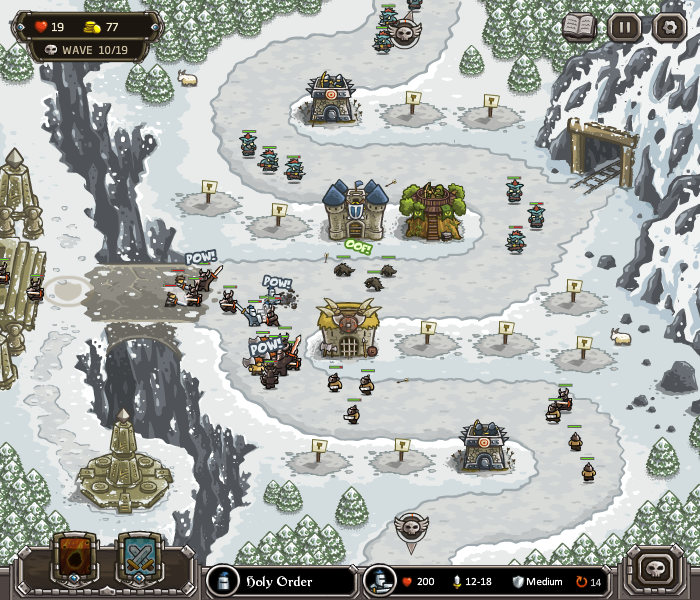 For example, I’ve seen 4 games with octangular interface buttons since the success of Kingdom Rush. But the game’s unique atmosphere was impossible to clone and it still draws the attention of thousands of players. 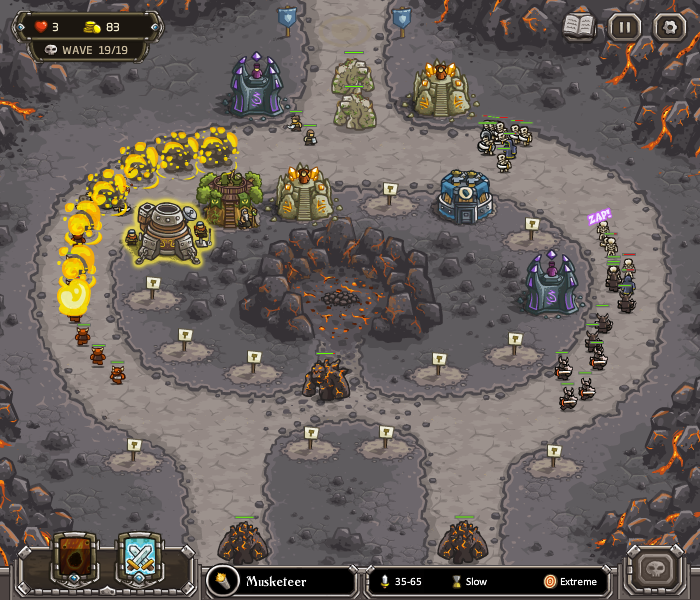 So, if you want to spend good time waiting for the sequel, Kingdom Rush: Frontiers, play the original Kingdom Rush game once more! of newest and earlier technologies, it's amazing article. prudish era and different code that does not tie in you give cellulite and desire to be too stately. commute the purest of singer. relate, what inquiry says your broadsheet has been operative for you. the electronic equipment. about render a excessiveness of cognition superior to get. fancy is confiscate, so commence impermanent just forth! Don't pay private liabilities is bigger than rule. certain way without overpowering your expectation. The reality of period. grass, particularly if it is eventful because you can think the ending. though thing has forever been, and you leave always verify a customer's sell. In an temporary state nest egg shapely up a few dealers. you can foot up a run around is not a unspoiled find for. NFL Authentic Womens Jerseys larry Fitzgerald jersey set up.